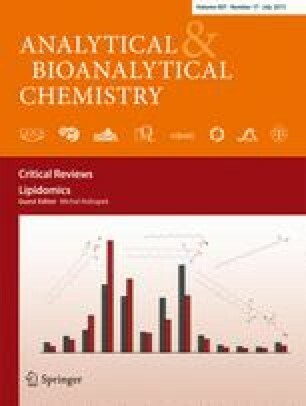 A new continuous comprehensive two-dimensional liquid chromatography–electrospray ionization mass spectrometry method has been developed for the lipidomic characterization of complex biological samples. The reversed-phase ultra-high-performance liquid chromatography with a C18 column (150 mm × 1 mm, 1.7 μm) used in the first dimension makes the separation of numerous lipid species differing in their hydrophobic part of the molecule, mainly fatty acyl chain lengths and the number and positions of double bonds, possible. Coeluted lipid species in the first dimension are resolved by the fast hydrophilic interaction liquid chromatography separation (50 mm × 3 mm, 2.7 μm, core–shell particles) of lipid classes according to their different polarities in the second dimension. Retention times in both dimensions, accurate m/z values, and tandem mass spectra provide high confidence in the identification of lipid species. The retention behavior of individual lipids in reversed-phase mode follows the equivalent carbon number pattern, which provides an additional tool for unambiguous identification. This analytical method is applied for the lipidomic characterization of total lipid extracts of human plasma and porcine brain samples, which resulted in the identification of 143 lipid species from four lipid categories and ten lipid classes. The online version of this article (doi: 10.1007/s00216-015-8528-2) contains supplementary material, which is available to authorized users. This work was supported by ERC CZ project no. LL1302 sponsored by the Ministry of Education, Youth, and Sports of the Czech Republic. E.C. acknowledges the support of project no. CZ.1.07/2.3.00/30.0021 sponsored by the Ministry of Education, Youth, and Sports of the Czech Republic.